Free shipping on fabric orders over $99.00! Free Shipping limited to the Continental US. OutdoorFabrics.com is your one-stop shop for furniture fabrics and outdoor curtains. We offer over 1,000 outdoor fabric patterns from top brands at wholesale prices, so you can create precisely the look you want for your outdoor or indoor space. We carry a huge selection of Sunbrella® fabrics, patio cushions, and outdoor drapes. Whether you’re looking to completely recover your outdoor furniture or just want to spruce up an older piece with a set of new custom cushions, you’ll find everything you need on our site. We carry a diverse range of outdoor fabrics, pillows, outdoor curtains, drapery rods, and umbrellas, available in beautiful, vibrant colors and prints. We are a partner and distributor of Glen Raven Inc. and Sunbrella® Fabrics. We maintain a stock of awning fabrics, furniture fabrics, indoor/outdoor patterns, and marine fabrics by Sunbrella®, as well as Dickson Fabrics, Robert Allen outdoor patterns, and Waverly Sun and Shade. Purchase fabric by the yard, or let us create custom cushions for you. Decorate your outdoor space with premium materials designed to last. 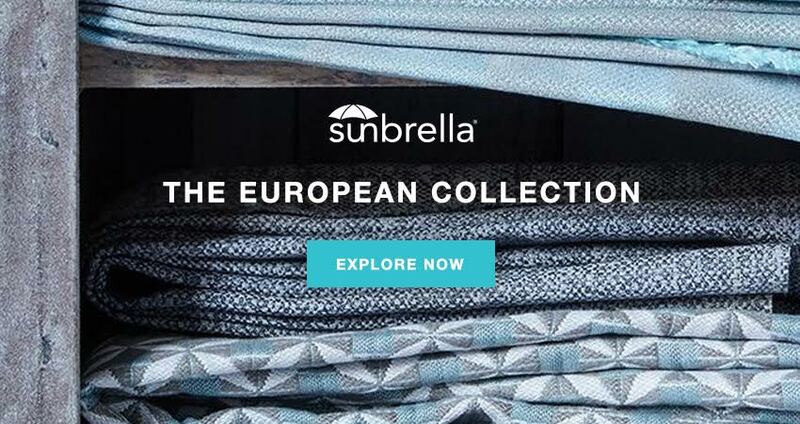 Sunbrella® furniture fabrics are produced from tough acrylic fibers, so they resist stains and mildew while maintaining their good looks indoors or out. Because Sunbrella® is manufactured using 100% solution-dyed yarns, the color won't fade or wash out, so you can be sure they'll remain vibrant for years to come, even under intense sun! Through the years, no other fabric will prove more enduring than Sunbrella®. And with a wide selection of stripes, solids, and textures, it's the best overall fabric for your furniture.